Ok so many of you write to me about porosity tests. These are the suggestions that you can test to see how porous your hair is by placing a few strands in water, wait for 10 minutes and see if the hair floats or sinks. 1. Hair in general will almost always float in water. Many of you doing this test will note that your hair will float for ages and it may take some prodding to make it sink if it does at all. This is because hair is generally covered in oil. This oil is naturally produced sebum and any extra that you may use in your hair care routine will have an added impact. Now oil will always float on water, so your hair floating does not mean that it has low porosity. It does mean that your hair is light (which it is) and has a coating of oil that repels water (which it does). 2. What would happen if you washed off the oil on hair using shampoo then performed the test? If you chose to do the test with hair that is freshly washed but not conditioned then that is really an artificial test because you would normally apply conditioner after a shampoo (Of course if you only shampoo then this test is not artificial for you). For most people hair will still float because there is usually still some residual oil. 3. Warm water or cold water? 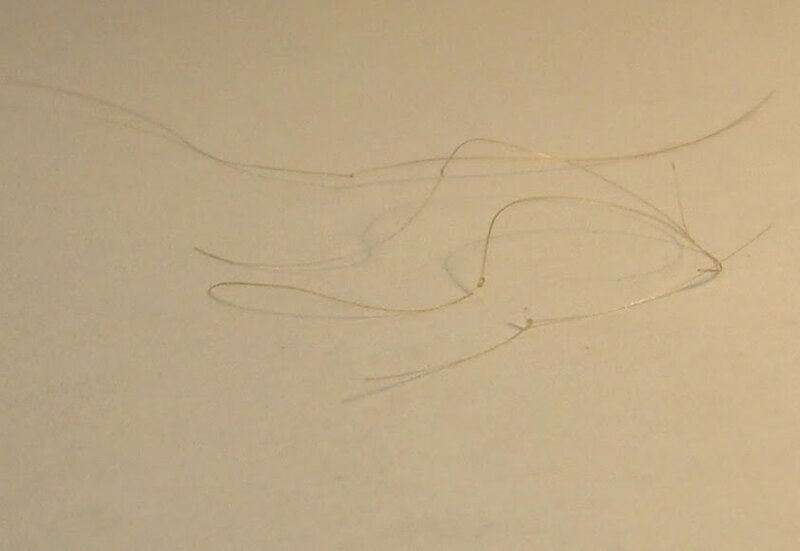 However, the most likely observation that most people will have with a single strand of hair is that it will float. 4. If hair sinks, is this because it has taken up water? 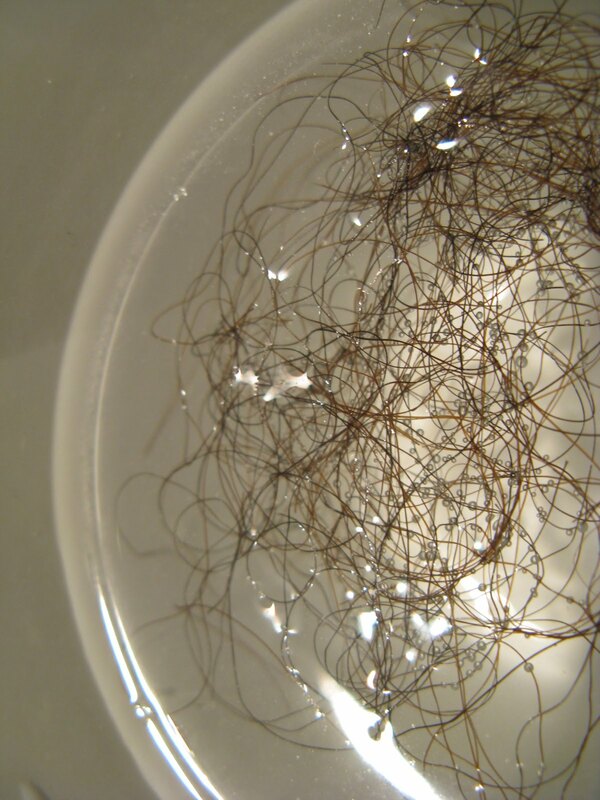 If you place hair strands in water they are going to take up water, this is a fact and this is normal. The more your hair takes up water, the heavier it will get but it may still float because of the oil coating. Hair could indeed sink and many relate this to damage (bleaching or relaxing hair for example makes the cuticle more porous) but it could also be that your hair is naturally dense (i.e naturally weighs more). So is there a scientific test to know how porous hair is? Is there a home - test for porosity? There is no single test that I would say is reliable. Many people think that hair repelling water is a bad thing but it really is not, it is excellent. It means your hair has its oil coating and is working well. The oil coating cannot fully block out water coming in or out, it is a permeable barrier. I do absolutely advocate for people to reject or accept products based on how they work. If a product leads your hair to be constantly dry, leave it. If a product makes your hair too mushy, stop using it. Find products that work by trusting yourself and your hair. Are you doing the sink/float porosity test? Did you find that you were low or high porosity? How did it help you? After reading this article would you reconsider? This article made a world of sense. I tried this 'test' recently out of curiosity and of course my hair floated but the suggested products to use based on the results of this test were all things that hadn't worked for me in the past so I ignored it and stuck with what does. To be sure, I tried it with freshly shed hair and shed hair that I cleansed with shampoo and got the same results. Hmm. Thanks for educating us on this. I am happy I have not bothered my head about this type of porousity test. Lol at junk science. I did this test before and was confused as to how it was suppose to help me find products lol. Its not like its listed on the bottle somewhere. Finding products is simply a science of trial and error. Either you like how it makes your hair feels or you don't. I have not performed any at-home porosity tests because I don't think they are reliable. However, I have wondered whether hair losing moisture easily can be an indication of higher porosity. I say this because by definition something porous lets substances through easily. Correct me if I'm wrong. I think the best way to find the best products for oneself is simply trial and error. I think that in some instances this is true but there is a big part to be played by atmosphere (humidity) and products. In humid areas, it is nearly impossible not to have really moist hair while when air is dry, this affects hair and skin. I prefer to think of porosity as a play with humidity. We pick products and techniques on the basis of which ones give our hair sufficient humidity and help maintain moisture. Thank you for tackling this technique! I am so tired of hearing people discussing this test and I've never wanted to try it nor did I feel it was all that special. I always appreciate your knowledge. I've never done the test, but this is great to read, because I see so many people share this as THE way to test porosity. Love this article. A lot of people obsess about porosity and after reading several blog articles on it I felt like most folks really had no evidence to support what they are talking about. I thought that this test sounded fishy. To this day I have no idea if my hair has low porosity. I don't think it matters if you know this or not b/c you really do just have to go through the trial and error process with products. I also think that this goes back to one of your articles where you indicated that sometimes hair will feel dry even when it is moisturized. Jc, this is a really good post. I've heard about this test but never attempted it. Thank you for providing a solid explanation behind why it is a junk science. You can always be counted on to bring the logic to hair. I've tried this test twice in the past and still didn't come up with a solid conclusion. I testes a freshly washed strand vs. hair with oil from my styling product and noticed that the clean hair sunk faster than the oiled hair. Meaning the test has to be done on freshly shampooed hair in order to get a more accurate result. I also noticed that my coiled hair (broken hair piece) sunk immediately after I dropped it in water, while the more stretched shed hair stayed afloat. Could it be that coily hair is more dense than less coiled (curly) hair? I think with any scientific test, lab or home based, there will always be a draw back to the technique used. This is why we have scientists always trying to prove each other wrong. one more thing to add is that this type of experiment might not be reasonable for someone with different hair textures and densities, because it will leave you confused like it left me. This is interesting. I did the test and based on it I am low porosity. I started using techniques to combat low porosity and my hair has responded so well! It stays moisturized for days and feels so much softer. This may be one of those areas that is like alternative methods versus hard science. Some people swear by alternative methods and other people don't believe in it because there is no science to prove it. Love the article! Nice work JC. That is exactly why you can not simply use one test to determine hair porosity. The water test was a total bust. The biggest lightbulb moment for me was a comment I read about. How long does it take for hair to become "wet" saturated with water? I work on three heads of hair including my own. I have to run the water for at least 3-5 minutes for both my oldest daughter and myself to have truly dripping wet hair. Whereas my youngest daughter's hair is dripping wet in less than two minutes. Her hair is longer and thicker than both of us! BTW we all have natural hair. See now, this is why I love this blog... :) I have tried the hair-in-water test several times over the years and never once did my hair sink. The way some folks feel about hair typing, I felt about porosity: I don't get it and I guess I'm not meant to get it so oh well, I'mma keep doing me, lol. Glad to see I was right and maybe this isn't something I need to worry about. Dear Jc - thanks for an enlightening article. I always suspected this was voodoo science because I've done the water porosity test and was not convinced (that I was low porosity) when my strands stayed afloat. I think this test may have been predicated on type 1 and 2 strands (by the Andre Walker system, my hair is type 4b(4c)). Not only do my strands float, my hair frizzes in humidity, and roller sets don't last more than 24 hours. Thank you for this! I stopped reading most natural hair blogs because so much "advice" was more blind opinion than scientific fact. There is another way to test for porosity, not just the water test (which is supposed to be only 2-3 strands). I know I have low porosity because products have a hard time penetrating. I knew these tests were not good science. I'm glad I never gave into the hype. I have to say that for me the hair porosity test provided a lot answers. My test came out low when I thought it would be high. I think that what matters is not what you call it but how your hair behaves and what led you to do the test. For me, when I was younger I had massive, unexplained split ends, tangles, and constant, outright rejection of hair products. I would constantly put stuff on my hair and follow all of the curly hair rules only to see my hair dry out very limp and frizzy full of knots and splits. When I first tried to embark upon a low porosity regimen though, I had no idea I was in for a long ride. I think that your point toward the end is the best of all. No matter what your porosity is, you have to learn how to listen to your hair. I have learned some very important things about my hair that I have made split ends a rare sight on my head. My hair has never had a problem growing long, but the splits used to be outrageous. While some ppl say their hair hates oils, my hair loves oils. In fact, oil is what my hair wants. My hair hates water based products, and it hates water spritzing. My hair does not appear to need protein and it seems harmful because my diet is too rich in protein. My hair wishes to get it's moisture from warm water in the shower (I do not seal whatsoever with cold water at all) and then I just let my hair get to about damp/dry, then I apply grapeseed oil. I manually remove any tangling with the oil on my hands then I brush it through for even distribution. Now the frizz, splits, knots and all else are a thing of the past. I do not use shampoo anymore as there is no need without all the product build up. Instead I just do a clay treatment to clarify once a month. I scrub my scalp with honey/brown sugar or coconut oil when I wet it and that helps move dirt out gently. I think it is safe to remove dirt as often as necessary, it is just that I never ever want to strip any natural oils. My hair has thrived on no poo. I love how you just break this stuff down in layman's terms by backing it up with pure science. It is funny that you blogged about this, because I kept seeing porosity, porosity, and porosity everywhere on various blogs and how to combat it. I did the test and unlike most people, my strands from various places on my head (middle crown medium density and the nape, fine strands in the back) and my strands sank to the bottom in less than a few seconds, not seemingly long enough to truly take in all the water to be fully wet for both hair textures. That "meant" I have highly porous hair. The kicker is....the recommendations does not work for my hair when it comes to combating highly porous hair like not using glycerin (my hair loves glycerin in ANY weather), my hair is naturally shiny (not dull or lackluster), my hair abhors proteins and is sensitive to them (makes it challenging at time for balancing), my hair only likes the heavier oils (has a hard time accepting and liking coconut oil), and it pretty much hates shea butter, and LOVES aloe vera gel. ALL of these things goes against the grain of what they are suggesting for my hair. I do have some colored highlights just in the front that are old. But I don't color more than twice in a 10 year span. I don't use heat at all and haven't in over 9 years. So, my hair is not damaged outside of the coloring job almost two years ago. Basically, I am just saying that naturals of color really need to heed to science (great stuff you supply) before believing and jumping on bandwagons. They typically include information that is flawed and passed on so many times that it becomes "falsely" true just by the shear number of times its gets repeated. I have made many mistakes since going natural in 1995 via straight BC when it was not popular and almost unheard of. And at the hands of false information has lead to 3 subsequent BC's in the first 10 years. What is unfortunate, but lessening is that we are FINALLY uncovering the real secrets to our hair that was buried the very first time we picked up a comb, hotcomb, and relaxer, and was lost when we were no longer in the land to learn the traditions of what good hair care is. J.C. I absolutely love your site. I know this is an old post. Just wondering if you've changed your mind about the 'test" after reading what the Beauty Brains posted how to perform it on their page and the reference they sited. I did the porosity test with my freshly washed non-conditioned 4b/4c hair, except I wanted my ENTIRE coiled strand to be wet in the water(i didnt let it sit on top) and so i pushed it till it was just below the water, it never sunk completely. It actually went around the top middle of the glass and stopped there. I even let it stay for hours and it didn't move. So I assumed "low porosity" and when I do tips to help (like adding heat in my regimen(something i stopped doing for years) to open my cuticles my hair LOVED it. Adding heat (to leave in's or even conditioning) actually made my hair feel extremely soft and shiny. So for me the test did work. But I modified it simply because I too thought hair would float, so I wanted my cuticles to fill up with water so I submerged the hair just a little below the top surface and let go to see what happens. I had no idea that people were attempting this test on hair that wasn't clarified thoroughly first. I knew product residue and sebum could interfere so I after I clarified my hair, I removed a few hairs through finger detangling on wet hair and then stuck them in a glass to get them coated with water before putting them right back on top. I know there's also the surface tension issue to deal with and my strands are fine, but I got the low porosity result and it was actually accurate for me. Now I do a low porosity curly girl routine where I clarify with baking soda, follow up with a mud wash and then do a steam treatment with conditioner where i detangle my hair and either do the LOC method for styling or a leave in under flaxseed gel. My hair has responded VERY well to these tweaks.